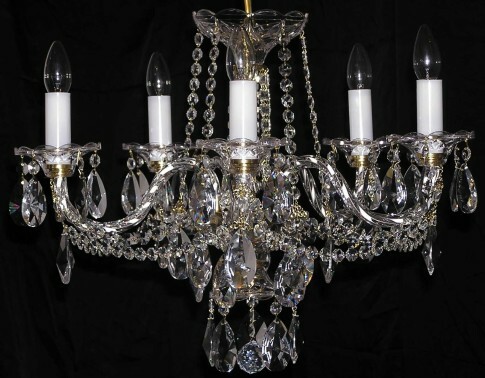 Czech crystal chandelier with 5 glass arms. 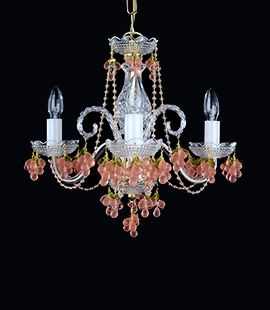 The chandelier is decorated with the top quality cut crystal almonds. Czech glass crystal chandelier wit 5 twisted glass arms. Trimmings hand cut crystal Swarovski almonds. The bobeches are made of hand cut crystal glass (chemically polished). Dimensions (W x H): 60 x 47 cm/ 24.5"x19.2"
You can order metal finish: Silver (nickel coated brass), or pure Brass.